Today would have been my Annie’s 37th birthday. She’s been gone 236 days but whenever I think about her age, it never fails to shock me. Today, I feel the absence of Annie on this trip more than any of the days that have passed by so far. There were moments on the airplane, when I looked at the empty seat next to me and I really felt like crying but I held back – at least until the toilet was vacant. I haven’t got a problem with crying – or crying in public at that (well, maybe just a little) – but for whatever reason I’d consider it a bit unnerving to see someone burst into tears at 30,000 feet and so I held off. A lot of things have been said about grief but I wonder if it’s ever been said that with great grief (and altitude) comes great responsibility? I recently posted regarding the thanksgiving service videos now available through my Vimeo channel. There were subsequently a few issues I have now ironed out. I have updated those previous two posts and they now include a new link to a dedicated Vimeo ‘channel’ where viewing the thanksgiving service videos is much easier and better! 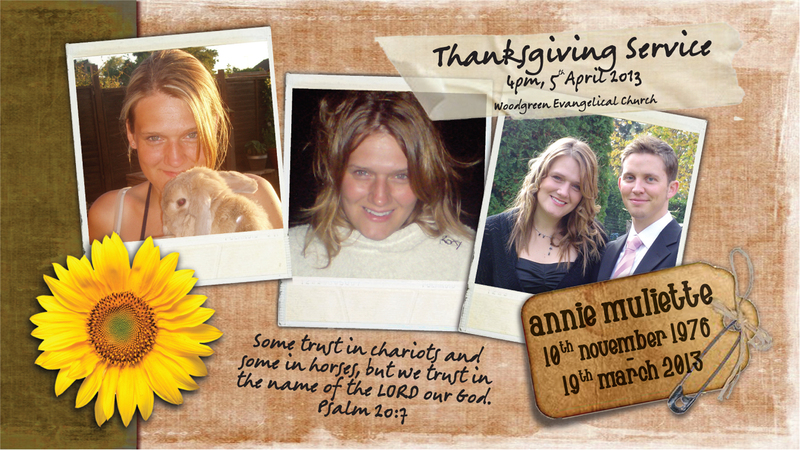 Click here for introduction and link to the videos of my Annie’s Thanksgiving Service.